A 52-year-old man died after he was hit by a taxi along Eng Neo Avenue on Saturday morning (Oct 27). The taxi driver, a 48-year-old man, was arrested for causing death by negligent act. 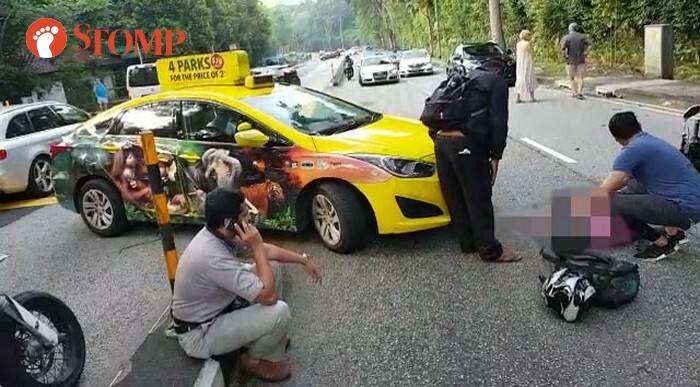 Stomper Young Kuan-Sing alerted Stomp to the accident and shared videos he took of the scene when he was there at about 8.40am. Stomp will not be uploading the videos due to their sensitive nature. In the videos, the motorcyclist is seen lying motionless on the road as a bystander taps him repeatedly, trying to get him to respond. "The taxi driver told me he is a relief driver," Mr Young, who is a 70-year-old retiree, said. "He was frantically making phone calls." In response to a Stomp media query, a police spokesman said they were alerted to the accident at about 8.27am. "The motorcyclist, a 52-year-old man, was pronounced dead by paramedics at scene," the spokesman said.